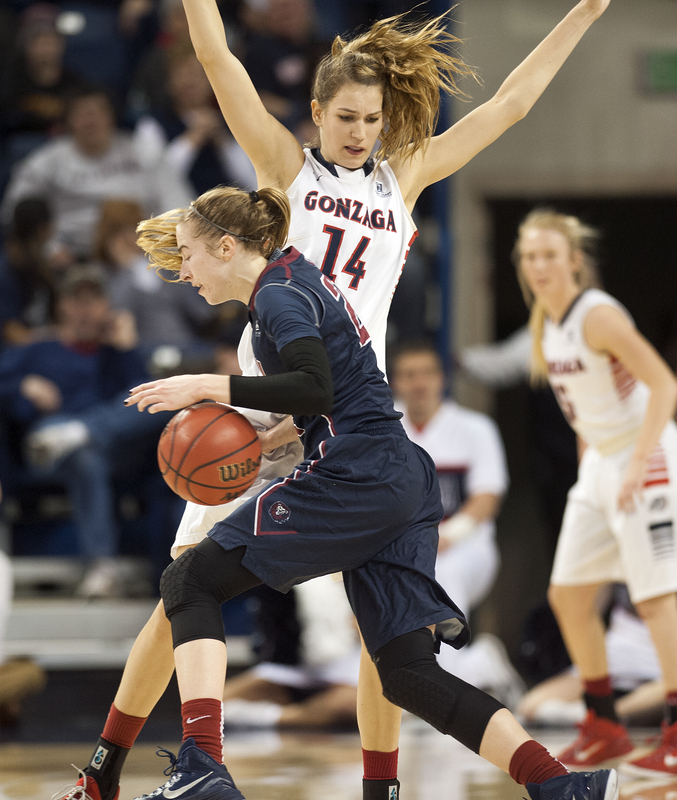 Thu., Jan. 29, 2015, 11:10 a.m.
Sonja “Sunny” Greinacher, 22, is a senior forward, and leading scorer, for the Gonzaga women’s basketball team. The two-time All-West Coast Conference player has already earned her bachelor’s degree in psychology and is currently pursuing her master’s degree in school counseling. She grew up in Essen, Germany, and agreed to come to the United States as an exchange student for her junior year of high school (2008-09). That year, she led Willamette High School to the Oregon 5A state championship game in which she scored 24 points and grabbed 12 rebounds to claim the title. Greinacher, who currently averages 14.1 points and 6.1 rebounds a game, also played three years for the German U18 team before she accepted a scholarship to play for Gonzaga. Q: Before playing basketball, what sport did you expect yourself to play the most. A: Well we don’t play for our schools. We usually play for a club. I played basketball ever since I was very young. I tried some other stuff. I tried track and hockey but I didn’t stick with any of that. I always played basketball the best. Q: What’s a decision somewhere in your life that you made that worked out very well? A: I’m pretty fortunate to say I don’t regret any of my big decisions so far. Probably, the decision to go on my exchange year in the U.S. That also got me into college. That’s when college coaches started recruiting me. I didn’t really know anything about college. And obviously, I didn’t know anything about Gonzaga. Q: What is your biggest regret, something you would do differently if you could? A: That’s a good question. I don’t know. In Germany when you finish high school, you have a big exam. That’s what gets you into university. You have to have a great GPA to get into university. Probably studying a little harder for those exams would have been better. But there is nothing huge in my life that I regret. Q: In 40 years, how do you want those closest to you to describe you? A: Funny, kind … hard working and, oh that’s a tough one. Uh, yeah. Those probably. Q: When did you first realize that you were tall? A: Oh, actually I didn’t realize I was tall until I was older, probably like 16. That’s when I realized that I was significantly taller than any other girl. For my height, I’m also very skinny. But, I was never really concerned at all about body image. So, I didn’t pay attention to that. Q: What are the best and worst things about being 6-foot-4? A: The best things are probably how many doors were opened to me. Basketball-wise, people-wise, people come up and talk to you. People think it’s cool because it’s rare for a woman to be that tall. Sometimes you want to blend in a little better and not want people to stop you and ask you how tall you are. Sometimes I would like to just go to the mall and look for clothes without teenagers staring at you. In general, I really enjoy being tall. It’s better than being too short. Q: How do you find women’s clothes to fit your frame? It’s gotten a lot easier the older I got. Between 8-and-12 it was really hard to find jeans. In Germany, it’s not that hard. Here, I find myself ordering a lot of times online. It’s pretty cheap to order. Other than jeans, I don’t have any problems finding any clothes. Q: What is one thing that annoys you the most about being a Division I athlete? A: It is kind of like a job. There a lot of things outside of basketball that you are obligated to do. It’s not only that you have to show up for practice for two-and-a-half hours. There are lots of things you have to take care of outside of basketball. You have to rest a lot the day before a game. You end up sitting around a lot because they want you to be rested. When the whole team has to be there, it’s really kind of like a job. Sometimes you try to make plans with your friends or meet someone or have some alone time. There is not a lot of time for that because you always have to be somewhere. Q: How would you describe yourself so that a total stranger would feel he or she knows you? A: Well, tall, basketball player. I would say funny, open-minded, and pretty tolerant to basically everything. I can be a little impatient and I’m the baby of the family. Q: What is something about you that even your own teammates wouldn’t know? A: That’s hard, because after four years, they basically know everything about me. I have to think about that for a second. I don’t know. Q: If you ruled the world, what is one of the first things you would do? A: If I ruled the world, I would forbid any kind of war, especially for any kind of religious or money reasons. I would probably make it easier to travel without any kind of visa or any of that stuff. I would also lower gas and travel expenses. That’s about it. Q: If you never played another minute of basketball, how would you occupy your time? A: Oof, that’s hard. I would pick up Yoga. I would learn how to play the guitar because that has been my New Year’s resolution for three years in a row and I haven’t done it. Travel a lot. Volunteer at a local animal shelter. I probably would spend a little more time studying for school. Q: What would you tell an 8-year-old girl if she told you that she wanted to grow up to be you? A: Oh, I would tell her, she should be glad to be who she is. Not everyone is perfect. I would tell her, just that, she would be happy being herself if she is true to herself. Q: What is a story or joke you would tell about Lisa Fortier if you had to host her roast? A: I would probably tell about how she was the one who recruited me over the phone a lot. I found out later, she would have to stay up late in the night so she could call at an hour where I would answer the phone. I’m really bad answering emails and texts anyway. I would look at my phone see it was Gonzaga. I would never answer it. She kept calling and kept calling. Finally, I had to answer it. I’m super glad I did. I love how she coaches us and how kind she is. She’s the kind of person who tries to please everyone. She makes sure everyone’s feelings are respected. I guess I didn’t really roast her. Q: What is the best advice that your mother or father gave you when you left home? A: Probably just always keep working hard but stay true to who I am. My mom was always at every game. She watched every game. She always knew me best basketball-wise and that I was always eager to be one of the best players on my team. She told me, ‘Work hard and you will get there.’ But they also told me to stay true to who I am. Q: Having perspective of both Germany and United States, do sports get too much or not enough attention? A: I don’t think sports get too much attention here. There is definitely a lot of money that goes into there. I could see where international people may say you could use that money somewhere else. But I think it’s a key character of the United States. It brings people together, like the Rose Bowl. People get together and watch it together. Look at March Madness, people enjoy it so much. It’s not only good for the athletes; it’s good for the whole community and the whole country. It’s so unfortunate about sports in Germany. All they care about is soccer, and then only men’s soccer. The women’s soccer team won the World Cup two times. There are no teams with the universities. If international players come over, they don’t get paid very much. I think it’s very unfortunate. Q: Should American students learn at least one foreign language and why? A: Yeah, I think it would be beneficial for people to learn more than one language. Even if they travel somewhere, everyone else understands English. On my team before I came to Gonzaga, we had two Americans. Everyone was speaking English so they didn’t have to learn German. Every time they tried to speak it, people would answer in English. It’s not helping. I learned German, English and a little French in school. I think it would help travel-wise and being educated to learn a different language. Q: When you stub your toe or miss a shot, which language comes to mind first? A: Right now it’s definitely English. I’m not a big curser or talker on the court. But even in my head, it’s English. I don’t even speak German much anymore except when I Skype. When I go home, it flips back to German.